In the scene here I saw a man walking towards the sun so I quickly adjusted the shutter for a hand held shot. I approached this stranger to tell him I just got a picture of him that I really like and maybe he would like it too. Turns out he didn’t speak any english and my spanish isn’t very broken so after about three sentences with no getting through to the guy I just showed him the photo. He looked at me and said in spanish is that me? I said yes in excitement but he didn’t have an email address. I like to give someone something if I’m going to ask for a model release and this time the language barrier wasn’t not helping me. Now I’ve memorized how to explain this better next time. You never know when you’re going to need a release so even if you do run into a language barrier you can still try to speak with your hands as much as possible or look for someone nearby to help you. If you have something you can offer instantly in exchange after getting a big no on signing a release, it may get you another chance. Short tip on shooting silhouettes, shooting a silhouette can often be over looked in the days of HDR. In the quick passing moment there wasn’t enough time to set up for an HDR image anyway. One thing to look for is strong shapes. This entry was posted on March 1, 2011 at 8:25 am and is filed under Uncategorized. You can follow any responses to this entry through the RSS 2.0 feed. You can leave a response, or trackback from your own site. ¡Qué foto! ¡Muy bien hecho! Estoy seguro que el hombre le gustó también. Although I speak Spanish, I have found that if you type in any English phrase at translate.google.com, it usually does an acceptable job of getting it sort of right. Better than nothing and goos to have some useful phrases on hand in Southern California. I love this shot and think it is even better than an HDR would have been. IN this instance, where the man’s face is not recognizable, is a model release necessary? I had understood that it would not be essential. It is always good to get one, I understand, but I am hoping you might share your understanding on the face recognition aspect of model releases. I am not terribly knowledgeable on this front. Thanks and beautiful photograph!! Frank, thanks for the link. I’ll find it useful in the future. Becky, here in the states anyone could sue anyone for almost anything. It depends on who is going to use the image and what for. 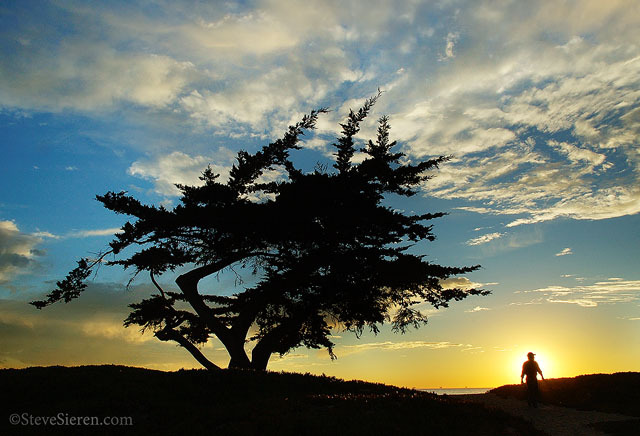 This image went on the cover of a California State Park map and a CD cover in Canada, no model release was asked for. The CD was for a charity raising money for cancer. If the guy wanted to take both parties to court to make a judge or jury believe it was him and the portrayal of having cancer was negative impact on his life then there could be a problem. All I can say is if you can get a model release it’s never a bad idea. There has been many times where I did not ask for one but sometimes you know you have something you’ll want one for. Do you need a model release on a situation like this ? Isn’t it supposed to be only for situations where the person is recognizable ? In the case of a silhouette, either the person has a very distinguishable feature that would allow him / her to be recognized in a silhouette, or he would not be recognizable at all, right ? So would we need a model release on a situation like this ? It’s true that anybody can sue for anything. In fact, even a model-released subject could sue you. But prevailing in court is a different matter. I have a hard time believing a judge would rule that the person in the picture is recognizable. I don’t think the person is at all recognizable so I agree with you QT. Pulling detail out this one could be tough with out a RAW file to identify the person and I added some black to help cover up the details. You never know what kind of match up representation both parties may have, sometimes the outcome can be shocking in court cases. It can be just word against word until any evidence is submitted. Joao, you only need the document if it’s going to help protect you from being sued. Everything you stated would have to be argued in court if isn’t settled out of court. Greg, that is a great idea and far less cumbersome or fearful way getting a signature at a later time. By then you can send them a file along with an explanation. This is an attractive photograph. I could see how it would market well and yet it also has artistic merit. I need to do a better job of remembering and taking the time to get model releases.